May 2019 sees a short uk tour from AGMP titled 'Soul Searching ' and featuring Ben Pirani, Mali Hayes, Laville. "Soul Searching" brings you the freshest new soul talent from around the globe for a chance to see the soul stars of tomorrow today. Laville is the first new male solo artist signed to Acid Jazz Records since Jamiroquai. 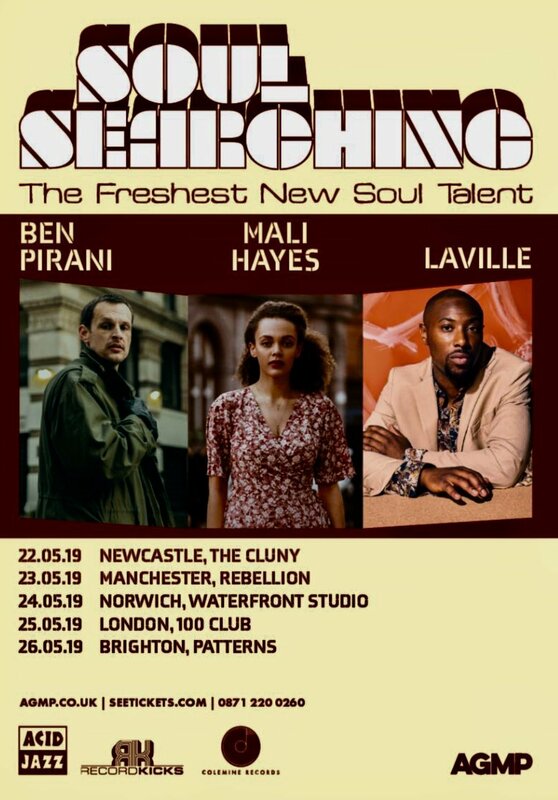 His first two singles "Easy" and "Thirty One" have created a buzz on the soul scene and these will be his first UK tour dates. Mali Hayes has received radio support from Gilles Peterson and Jamie Cullum for her jazzy-neo soul sound and has supported Bilal, Blue Lab Beats, Sons of Kemet and more. 'A really great new British female vocalist from Manchester..
She's got a real un-flashy kind of approach which I really like. Kind of a milder Jill Scott / Erykah Badu, definitely one to watch." "I was fortunate enough to play demo's on my shows here at the BBC by Amy Winehouse, Lily Allen, Erykah Badu and Jill Scott. All premiers. And this is another one I think I'm gonna be proud of in a few years. Remember the name, Mali Hayes"
Follow-up to the Northern Soul Once Upon A Time in Wigan play? Cd Only Tracks That You Love . great stuff , particularly Laville . Shame its not coming to Yorkshire. Just a question.. Ive seen some tour posters on Facebook listing Canadian singer Tanika Charles instead of Mali Hayes ?